Further details of the proposals to renovate the Queen’s Theatre in the West End have been revealed, including plans to add a row of seating and new boxes in the dress circle. The theatre has been home to Les Miserables for more than 10 years. 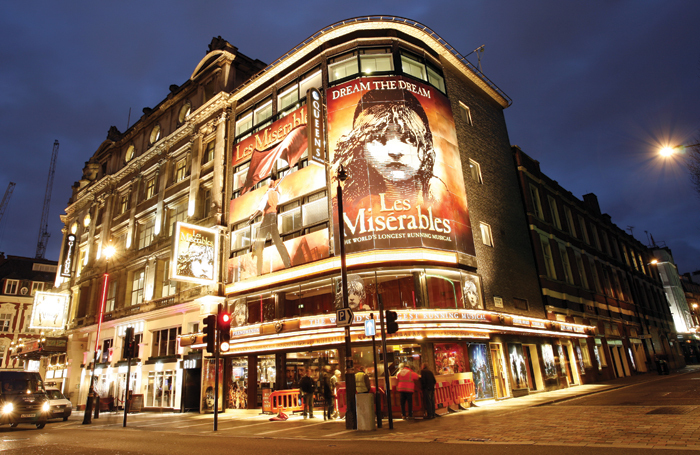 Earlier this year it was announced that the long-running musical will move to another West End location  while the planned refurbishment takes place in 2019/20. The renovation, for which owner Delfont Mackintosh has submitted plans to Westminster council, includes adjustments to seating in the stalls and the re-profiling of the dress circle to add a new row. Under the plans, five new audience boxes would be added to the back of the dress circle. These will either be built into the back wall of the dress circle or will occupy what is currently a VIP room and a storage space. This means the audience capacity, which currently stands at 1,099, is likely to increase. However, Delfont Mackintosh said multiple options were being considered, and it could could not confirm a figure for what the change might be. The renovation could also involve lowering the stage by 100mm in order to ensure it will be able to “meet the demands of contemporary theatre presentation”. Additionally, two accessible seating boxes on either side of the dress circle are to be opened up into the adjacent corridor spaces behind, “to improve comfort and manoeuvrability within the space”. The plasterwork ceilings of the theatre will be strengthened to extend their life, which is part of a wider programme of ceiling works across Delfont Mackintosh’s West End venues. The proposals also include redecorating the theatre’s interior, plans that are being developed in conjunction with interior theatre designer Clare Ferraby, who won the Unsung Hero award at The Stage Awards 2017 . A separate planning application has been submitted to increase the number of toilets in the Queen’s . Delfont Mackintosh declined to comment further on the plans.